I was thrilled to see that Carla at My 1/2 Dozen Daily was doing a 5 Things Friday today! This has been a crazy week (for me) so this gives me a good opportunity to share some snippets of what's going on in my world without devoting a whole post to them. 1. Hubby and I drove to Boise, ID yesterday enjoying beautiful Spring weather with temperatures in the low 50s (F)! Funny story...we went to Whole Foods to get some goodies to eat. Leaving Whole Foods Hubby asked Siri for directions to get back to the motel. We were started in the right direction, then Siri turned us around and was heading us toward the freeway. Hubby picked up his phone to see what was up and realized Siri was directing us to the Red Lion in Pennsylvania and we would arrive in three days. He pulled over, got the map via Google Maps and we arrived at our motel in about 5 minutes! 2. I have been in a real creative slump for the last couple of months:( I need a really fun project that I can't put down to get my mojo up and running again! Any ideas??? 3. Daughter, granddaughter and I will be leaving on our road trip to visit family on Sunday!!! We have been looking forward to/dreading this trip for 3 months! Can't believe it's finally here:) DD is buying DGD a journal so she can journal about the trip. We will take pictures and get them printed so she can add them to her journal and have something truly memorable to take home. DGD loves to write and is enjoying a scrapbooking club she is in so this project should be really fun for her. 4. I recently discovered (via One Good Thing by Jillee) a DIY heavy duty cleaner that I LOVE!!! You mix 1 part Dawn Dish Soap and 2 parts Hydrogen Peroxide in a spray bottle! This cleaner is truly awesome! It gets oily spots out of fabric as well as dried blood! It also gets those nasty yellow sweat stains out of white (or colored) clothes. A less aggressive cleaner can be made with equal parts water and Hydrogen Peroxide plus a couple drops Dawn Dish Soap. 5. My favorite iPod/iPhone app is Redo by Iterex Ltd. I love to make lists and this app allows me to make lists, check off the items and then put the items back on my list when needed! I use it for trips, shopping and to do lists! I have been using it a lot lately so I don't forget things. When I think of something that needs to go on the list I just put it on and forget it:) The best part? I always know where my list is--no more bits of paper here there and everywhere!!! The cost? A very reasonable $1.99. 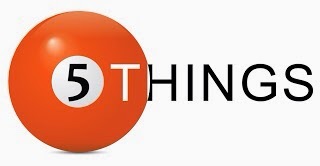 I hope you enjoyed my 5 Things Friday! Perhaps something along the road trip will spark your imagination. Siri! Bad computer program, bad! I am going to try that cleaner. I always make my own but haven't made this particular recipe before so I am going to try it. I am addicted to the cleaner! Please share your cleaner recipes with me! RE #1…that Siri is such a kidder! Kidder or not, I am not a fan of Siri! She can't even find Red Box!! !